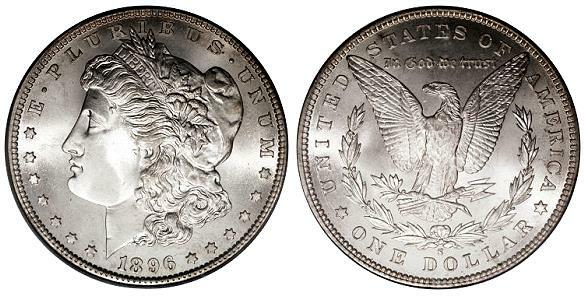 Silver Dollar – How Much Is It Worth? After identifying their coin we’ll direct that person to a local coin dealer or our website because there are many factors that contribute to the value of a coin and it’s nearly impossible to do it blind. If they want to sell their coin, most times they end up mailing it in to us and we assess the coin when it arrives. 1794-1873: This covers the early dollars such as the Flowing Hair Dollar, Bust Dollar, Gobrecht Dollar, Seated Liberty Dollar, and also the Trade Dollar (although the Trade Dollar was minted until 1885 it’s usually lumped in with these coins). 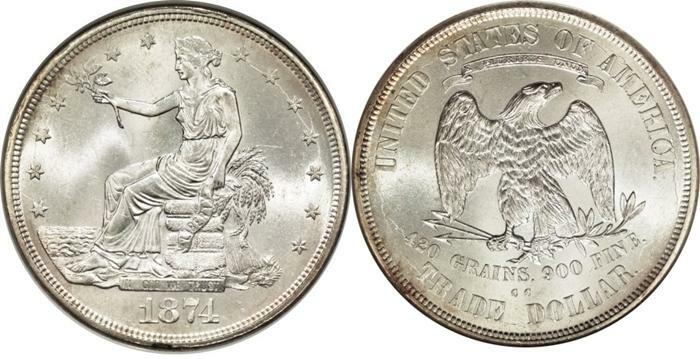 1878-1935: This is the meat and potatoes of the silver dollar era and also the most popular. This period comprises two coins, the Morgan Dollar (the most popular silver dollar – and arguably most popular U.S. coin) and the Peace Dollar. 1971-1976: This period covers strictly Eisenhower Dollars (known as “Ikes” amongst avid coin collectors). Only a handful of specific dates were made in 40% silver composition, the rest of the circulating Eisenhowers were composed of copper-nickel clad and contain no silver. All values listed below are derived from the Red Book, the definitive guide for U.S. coins. Please keep in mind many factors are involved such as the date of the coin, mintmark, variations, grade, etc. For the sake of the value below we are applying a grading range from Almost Good to Mint State. For a detailed guide, view our previous blog post on coin grading. The Flowing Hair Dollar is one of the earliest dollars minted by the United States. While there are many varieties that can be found, it is very difficult to keep track of their details because all of these early dies were made individually. Because modern technology was not available, no two dies were the same and as such, strike variations occurred. Not only were the dies different, but the silver blanks that were used prior to being stamped were weighed by hand as well and if a die was overweight it was filed down (again by hand) to achieve the correct weight. Conversely, if a blank was too light, a silver plug was inserted in the center of the blank planchet before the coin was struck. Very similar to the Flowing Hair Dollar, the Draped Bust Dollar has many variations when it comes to their uniformity (different thicknesses, off-center dies, etc.). 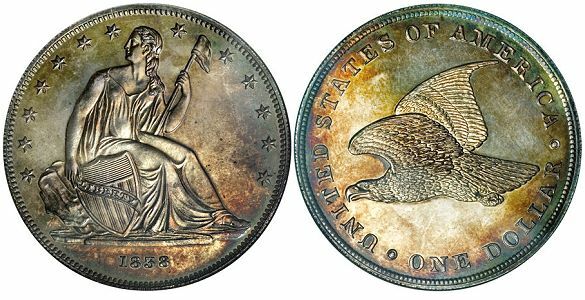 There was also a design change in 1798 called the Heraldic Eagle Reverse where the eagle design was changed from an anemic-looking eagle (many in the industry call this bird sickly-looking) to a more patriotic eagle with a shield. Also, there is a very rare variation known as the 1804 Dollar. Note: there are more expensive Heraldic Eagle Reverse Draped Bust Dollar coins, most notably 2 that are dated 1801 Proof Restrike dollars (reverse struck from first die of 1804 dollar) that are valued at $1,000,000. 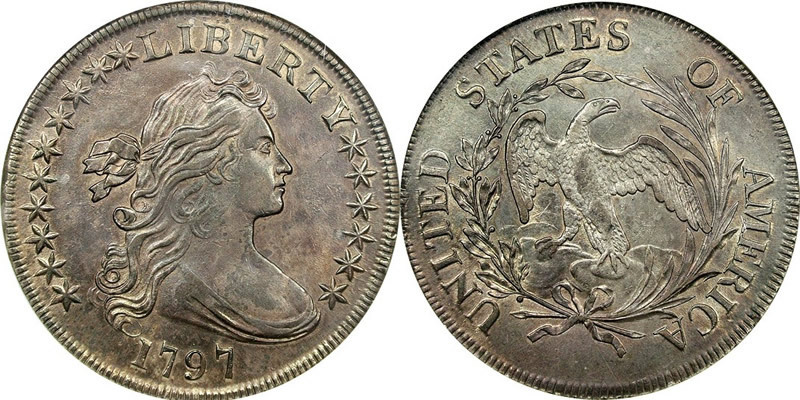 “The 1804 dollar is one of the most publicized rarities in the entire series of United State coins. There are specimens known as originals (first reverse), of which eight are known; and restrikes (second reverse), of which seven are known, one of which has a plain edge. Numismatists have found that the 1804 original dollars were first struck at the Mint in the 1834 through 1835 period, for use in presentation Proof sets. The first coin to be owned by a collector, a Proof, was obtained from a Mint officer by Matthew Stickney on May 9, 1843, in exchange for an Immune Comumbia piece in gold. Later, beginning in 1859, the pieces known as restrikes and electrotypes were made at the Mint to supply the needs of collectors who wanted examples of these dollars. Evidence that these pieces were struck during the later period is based on the fact that the 1804 dollars differ from issues of 1803 or earlier and conform more closely to those struck after 1836, their edges or borders having beaded segments and raised rims, not elongated denticles such as are found on the earlier dates. 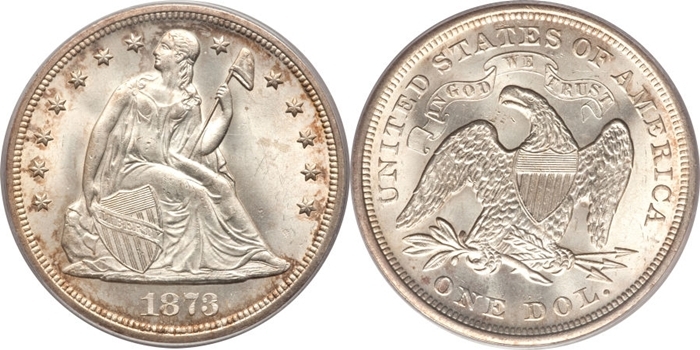 “The coinage law of 1873 made no provision for the standard silver dollar. During the lapse in coinage of this denomination, the gold dollar became the unit coin, and the trade dollar was used for commercial transactions with the Orient. 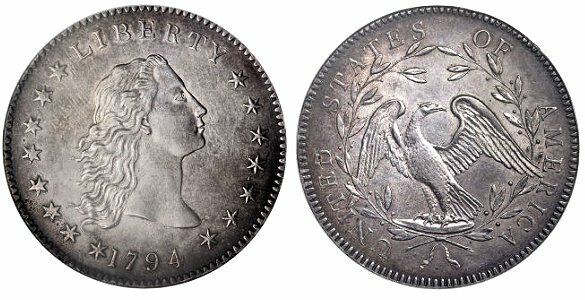 Resumption of coinage of the silver dollar was authorized by the Act of February 28, 1878, known as the Bland-Allison Act. The weight (412-1/2 grains) and fineness (.900) were to conform with the Act of January 18, 1837. George T Morgan, formerly a pupil of William Wyon in the Royal Mint in London, designed the new dollar. His initial M is found at the truncation of the neck, at the last tress. It also appears on the reverse on the left-hand loop of the ribbon. 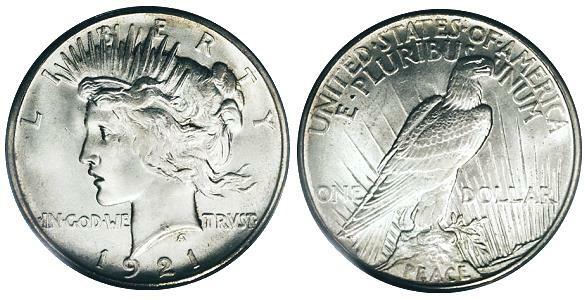 “The dollars of new design issued from December 1921 through 1935 was a commemorative peace coin. The Peace dollar was issued without congressional sanction, under the terms of the Pittman Act, which referred to the bullion and in no way affected the design. Anthony de Francisci, a medalist, designed this dollar. His monogram is located in the field of the coin under the neck of Liberty. 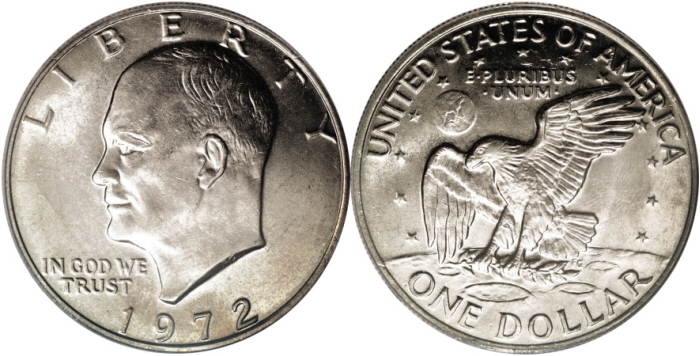 This new Peace dollar was placed in circulation on January 3, 1922; 1,000,473 pieces had been struck in December 1921. The high relief of the 1921 design was found impractical for coinage and was modified to low or shallow relief in 1922, after 35,401 coins had been made and most of them melted at the mint. The rare Matte and Satin Finish Proofs of 1922 are of both the high-relief style of 921 and the normal-relief style. Yeoman, R.S. The Official Red Book – A Guide Book Of United States Coins. Atlanta: Whitman Publishing, 2010. I have an 1878 cc Morgan in I guess fair shape, but stamped across the face in my great great grandfather’s name. Is this coin still worth anything?